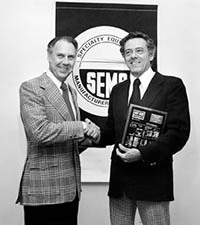 SEMA Hall of Fame - Ray Brown, 1991, Superior Industries. Ray started his career with his speed shop, Ray Brown Automotive, where he developed and marketed the first-ever lap-style seat belt sold for passenger car use. He maintained a career at Superior Industries International, a supplier of aluminum alloy wheels to General Motors and other carmakers. But he was also a racer, gaining Southern California Timing Association timing tags at the dry lakes with his legendary 1932 roadster, and he made history at Bonneville by running a Chrysler Hemi, making it a household word.